Here, Daniel S. Janik, MD, PhD, argues replacing education and teaching with non-traumatic, curiosity-based, discovery-driven, and mentor-assisted transformational learning. 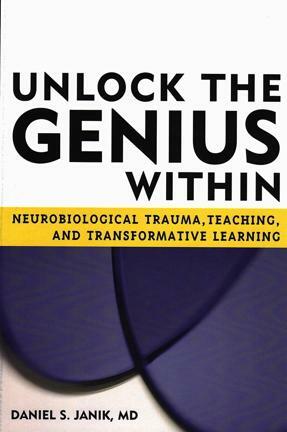 Unlock the Genius Within is an easy read that explains―in conversational manner―the newest ideas on neurobiological and transformational learning beginning with what's wrong with education and ending with a call for reader participation in developing and applying neurobiological learning and transformational learning theory and methodology. Janik draws extensively from his own experiences first as a physician working with psychological recovery from trauma, and then as an educator and linguist in applying neurobiological-based transformational learning in clinics, classrooms, and tutoring. Throughout this book, the author incorporates humor, wisdom, and anecdotes to draw readers into traditionally incomprehensible concepts and information that demonstrates transformational learning. It will be of interest to teachers (postsecondary, secondary, and ESL), administrators, counselors, parents, students, and medical researchers. "A welcome addition to current work on...effective learning...a text stripped of...jargon, highlighting the most compelling and important contemporary contributions to neurobiological learning...[and] its derivative, transformational learning" - Sofia Micic, PhD, University of Belgrade School of Medicine, Yugoslavia. "a quantum leap ahead...thought-provoking, eye-opening and immensely immersive...personally recommend it to all my...colleagues...and our future student teachers" - Seppo Tella, PhD, University of Helsinki, Finland.